Not a Short Sale. 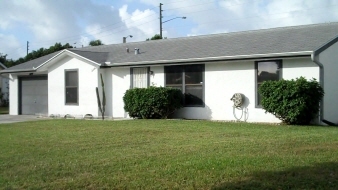 Beautifully maintained 2 bedroom 2 bath home in Foxwood Estates. Easy living - Tile and Laminate Floors. Neutral thorughout. New Glass Shower in Master Bath. Good Storage space too. This home is spacious with more SF under Air. As large as a 3 Bedroom! Must See If you Want Value and move In condition. Close to everything PB Airport, Shopping, Restaurants, Beaches, Downtown & CityPlace & Clematis Street. Large Screened Porch with Sliding door to Dining Room. Above Ground Pool with Deck. Well maintained by owner for 27 years.